Time to go. Oh King Arthur, I will miss you and your €4 Oranginas. I took an early flight home, via Spain. 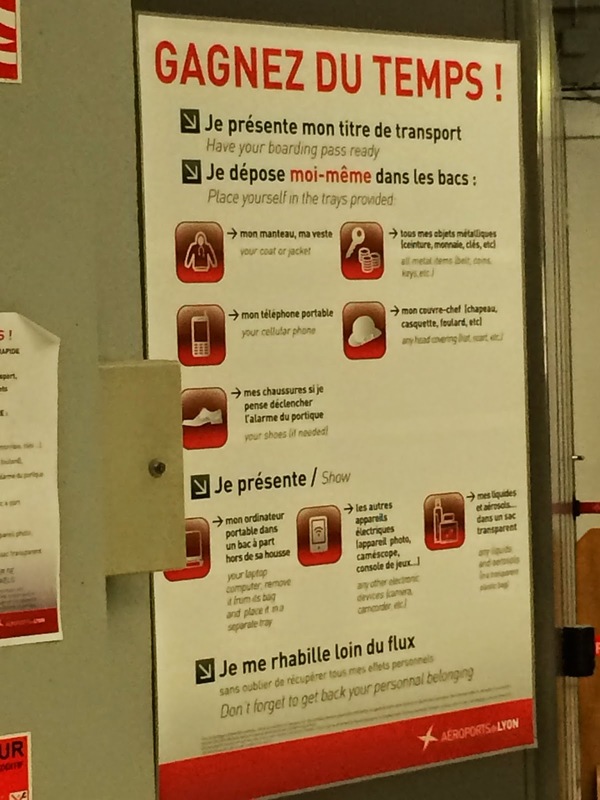 Note the tremendous translation on this security sign. Can you spot the error? Place yourself in the trays provided. I love it, but I couldn't manage to fit. I had a great time in France. It was a great learning experience, I was able to see great art, and some not so great art. 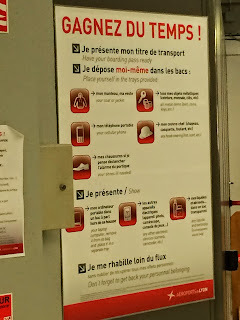 I realized that I can get by without knowing a language, but I'd prefer to know I little more than "Thank you" and "I don't speak French", which phrase I was able to use twice when I was at the mall in Lyon. I was really impressed with EmLyon's facilities. Especially the breakout rooms for the MBA students, which is one thing I wish we had more of at UTD. Two rooms just isn't enough for a class with 12 groups. Okay, there's my pitch for upgraded group breakout rooms for the Cohorts! Anyway, although I was hesitant about France before I left, the chance to visit the Normandy beaches, combined with the educational sessions, and the opportunity to spend more time with my classmates in a social setting, was something that I truly enjoyed. I had a great time, it is really is an experience that I will not forget...except for that one session where I forgot my notepad, I guess. But except for that, it was very memorable. I truly do wish I could forget how much money I spent on Orangina, but that's something that will probably never go away. Au revoir! Chamber of Commerce today, with a presentation by someone from the US Embassy. One thing I discovered is that American who marry French women end up living in France. I learned this throughout extensive research of asking Ricky and the US Embassy guy, both of whom replied, "I married a French woman," when I asked them how they ended up in France. Exhaustive research, I know. The efforts I go through to get the data I need! It was very interesting to hear about his efforts to get companies to invest in France, or to create jobs in France. In the afternoon, I wandered around the city. I went back to the Atelier de Soie in order to purchase a scarf for my wife. i discovered that I didn't know which one to get. While I was there, two older ladies came in, looking to purchase a scarf for themselves. it was fascinating to watch them trying to decide with the saleswoman. They would pull out a scarf, and discuss options, and I felt like I could understand the gist of what they were discussing, even if I had no clue what they were saying. However, i did catch at one point that they asked about me, and the saleswoman replied that I was shopping for my wife, and couldn't decide. Who says you have to speak French to know what is going on? After the ladies left, I was able to spot one of the scarves they had pulled out, and selected it for my wife. 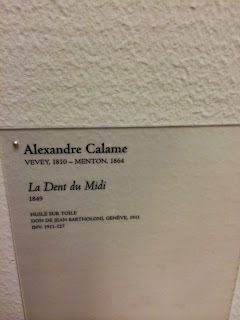 I also went to the bead Arts museum in Lyon, and discovered a number of pieced that I loved. Including this marble sculpture of a dog, which is so realistic, and portrays so much emotion in the face. After I ate dinner, I spotted some people I recognized at a restaurant. 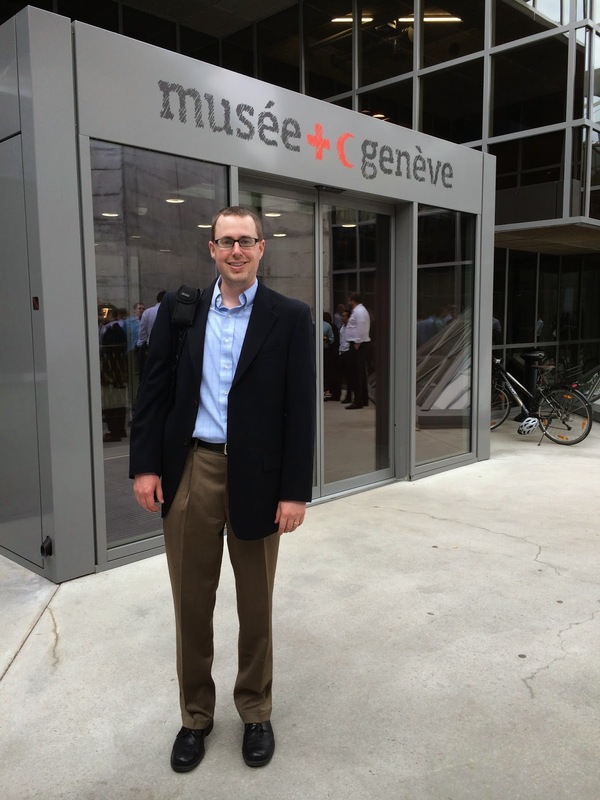 Thursday morning, we got on a bus and headed to Geneva. I have to say, I am a little disappointed with myself for not having secured a ham hock. There is a line in Stalag 17, one of my favorite movies, which is about a POW camp during World War II. The Genveva man has come to inspect the camp, and the German guard is explaining how "nice" the prisoners have it. He goes to the soup pot and attempts to find the ham hock that should be in the soup, but in reality never is. He states, there should be a ham hock!" One of the prisoners then says, 'When we find it, we'll send it to Geneva." Alas, my opportunity to have a picture of me holding a ham hock in Geneva to be able to send to my brothers and dad never materialized, and I will probably regret it for the rest of my life. But on to more important things! The bus trip was fascinating, with us going through mountains, with an occasional village popping up. 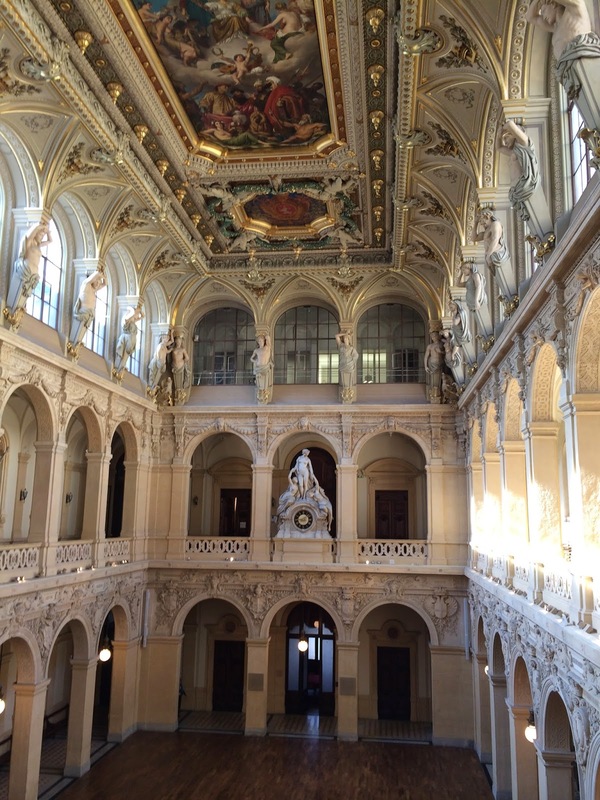 Getting through the border into Switzerland was easy, and we arrived at the headquarters of the WTO. We had a great session that talked about the purpose of the WTO, and having been up early, I admit I was struggling a little, but then the speaker launched into what I refer to as the "economic warfare" phase of the presentation, and I found this very interesting. He detailed the mechanics of voting for various things, sand also the consequences of actions made by various countries, and the types of redress other countries can seek when violations take place. It was inters tin that voting to pass regulations or agreements requires a unanimous affirmation, while sanctions to punish require a unanimous rejection of the sanctions. A very interesting dynamic. We also visited the headquarters of the International Red Cross/Red Crescent Organization. One of the exhibits allowed you to play a game to try and save an island from a hurricane. A game? Yes please. I played it 4 times. At one point I realized I was loudly directing a complete stranger on what to do. What can I say, I'm naturally inclined to tell others what to do. I think it's my parenting skills kicking in. Ask Josh about that trait during our visit to the University. In any case, full points on the island saving. While spending time walking around Geneva, Marcus and I wandered near the Beax Arts Museum, and I entered looking for a restroom. 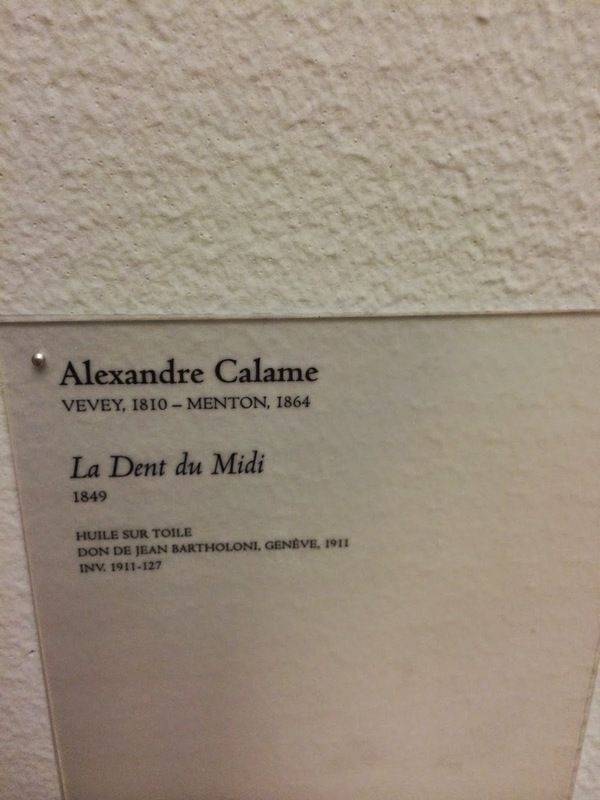 When we realized the museum was free, we wandered around, and encountered a number of painting by Monet, Renoir, Picasso, and one by Olivier Mosset, which I struggle to find words to describe, and have trouble in locating the part where it belongs anywhere in the same building as previous artists I named. Although, I wouldn't exactly put Picasso with those others either. It's almost as if after Picasso became great, he realized he could put any old junk effort out there and people would swoon over it, which they did. He must have been laughing at us all the whole time over some of those pieces. I also discovered an artist I hadn't heard of before, but really enjoyed his works. Here's a Monet & Renoir. On Wednesday, we had our final session at Emlyon, by Niki Papadopolou. She was able to tell us about her experiences as a US expat in France. She talked about the French education system as well. What I found interesting was that even when she began working somewhere it was two years before she had any non-business interaction with her coworkers, and 6 months before she was invited to lunch during work. This is very different from America. Just in my internship, I was taken to lunch by my manager the first day I was there, and have had many opportunities to have lunch with other coworkers as well. We then went back and visited the Atelier de Soie, which is the last place in Lyon which still does silkscreening by hand. The owner is a fourth generation silkscreened, who gave us a demonstration that made it look easy, but I am sure was not. They also explained the process of creating these silk hang ins that use rayon thread, and are hand painted, with each section taking 10 hours to complete. Afterwards, I stopped with Evan & Julia to get something to drink and people watch at the large square with a fascinating fountain. I ordered an Orangina. Surprise! Sad to say, i'm not sure I took any pictures of Orangina while I was in France. Tuesday morning, Evan, Joe, Chris Reed, Josh and I travelled down to Universitie No 3, Jean Moulin, in order to talk to university students about their majors, what job prospects they expected after they graduate, and the general job climate in France. It was interesting to see some similarities in their majors, the majority of whom we spoke to were in business/finance. I was impressed with the number of students who spoke English, and the few I spoke to had actually spent significant time studying abroad to help their English, usually in England. In the afternoon, we had another session at Emlyon, where another German professor, Fred Seidel, spoke to us about European businesses. To be honest, I forgot my notepad for this session, and I would like to say I remember every word, but this one seems to have slipped through the cracks for me. Thus I have learned a valuable lesson about always having a notepad, which is something that has been extremely important during my internship, as I have been meeting with a lot of people to discuss their roles and insights regarding my internship project. In the evening, we traveled to the Beaujolais, which was fun. I was surprised at how low to the ground the grape vines are, 40 cm, which they keep consistent. When I lived in Delano, CA, the grapevines there were elevated to about 4-5 feet off the ground. On the way back, the bus driver allowed us to use the PA system for singing. Having had a little too much water to drink, I was in rare form and went up to sing Let It Go, from the movie Frozen, which I have sung many times for my 5 year old daughter. Let's just say if this is what I will do after drinking water, you can only imagine what I might sing after I drink a few bottles of Orangina. Perhaps Let It Go in French? Side Note: Orangina was my drink of choice in France, seeing as how I don't drink alcohol. On Monday, we had our first session at Emlyon. The professor was Han Schlierer, a German, who spoke about Negotiating with Europeans. A few of the insightsthat I found interesting were: We are negotiating all the time. – This is true, although we might not always think about it that way. Essentially, we are always negotiating for just about everything in life. Trade is theft. – He talked about the fact that for much of Europe, their historical culture related to the Roman Catholic Church meant that the idea of doing things for profit was, in many ways, similar to theft. This results in a less capitalistic viewpoint that what can be seen in America. Negotiations are always with individuals. – The relationship is so important in negotiations with Europeans. This is something that I am not good at. Developing good business relationships takes work and effort similar to networking as a business student. I have made efforts to be more outgoing by attending far more events and social activities than is my general desire to do. However, I have realized that the benefits of increasing my network, and building a relationship with those people, will have the potential to open doors in the future. Additionally, I have been able to make more friends this way. Yes, my €4 Oranginas will pay off down the road! 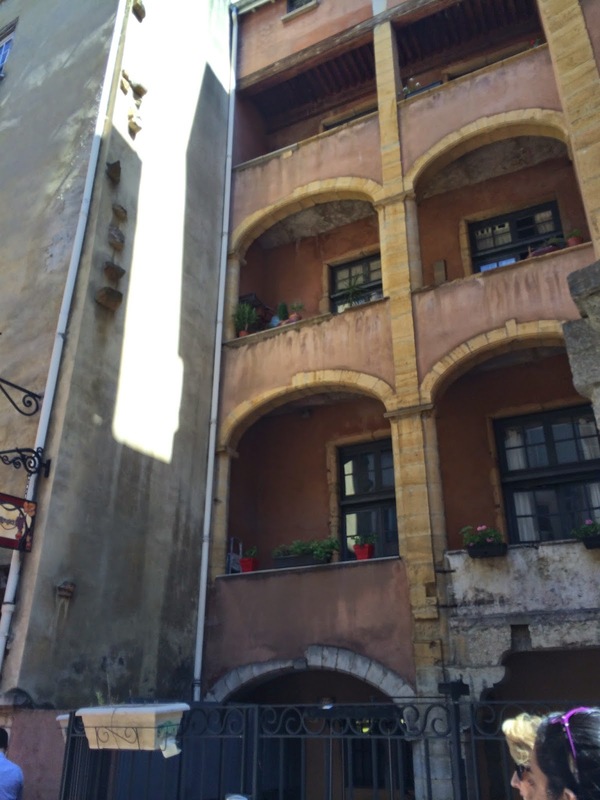 On Sunday morning, we took a tour of Old Lyon, which was very interesting. 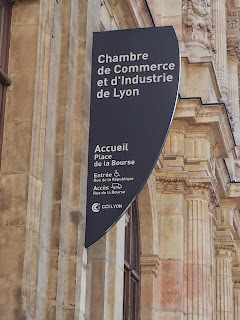 Our guide explained the history behind the name of Lyon, which at one time was the Roman city called Lugdunum. Our guide mentioned that this was a city that appeared in the comics of Asterix, of which I am a fan, and own several at home, which I have pulled out to read with my oldest kids. Our guide also took us through traboules, which are passageways through buildings, and can be accessed via doors that look like normal doors to a building. 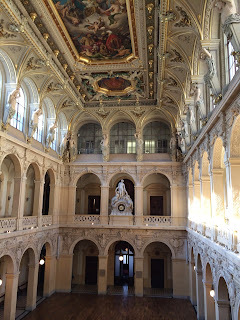 It was interesting that the culture at the time was to not flaunt wealth, and thus the buildings all had similar facades, and the courtyards were inside, behind the building fronts. Apparently, in the 1960’s there was an effort to preserve the old town, but our guide showed us a building where the façade had been torn down before it was banned. In the afternoon, I ventured south, via Metro and tram, in order to visit the Museum of the Occupation & Resistance. During World War II, Lyon was part of Vichy France, which was essentially a government set up in support of Germany. 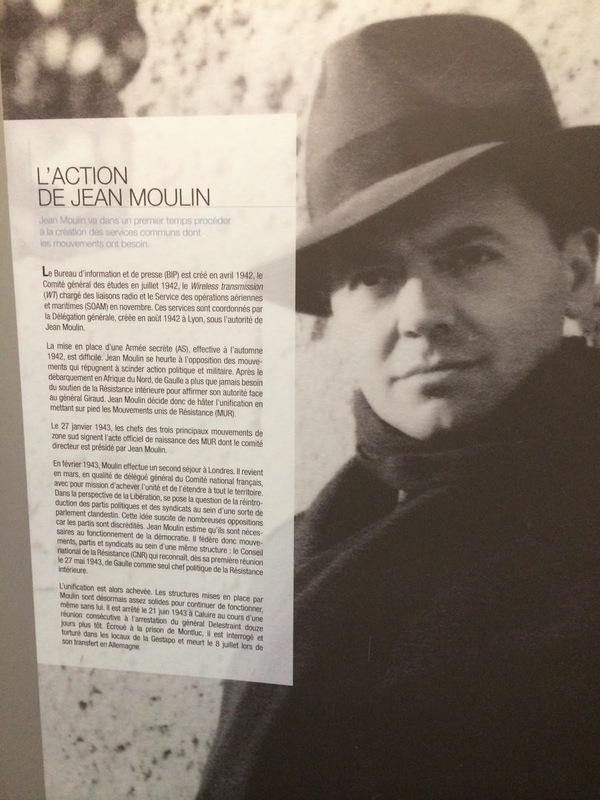 The museum talked about the efforts of the resistance, led by Jean Moulin, who parachuted in to organize the resistance in this part of France. The museum was also full of personal stories of those who had lived in Lyon during that time. It was interesting to note that the stories ranged from teenagers who just accepted air raid sirens as a good excuse to get out of school, to a woman who worked at the Gestapo office and would memorize names to pass on to the resistance. The museum is at the location of the Gestapo office during that time. 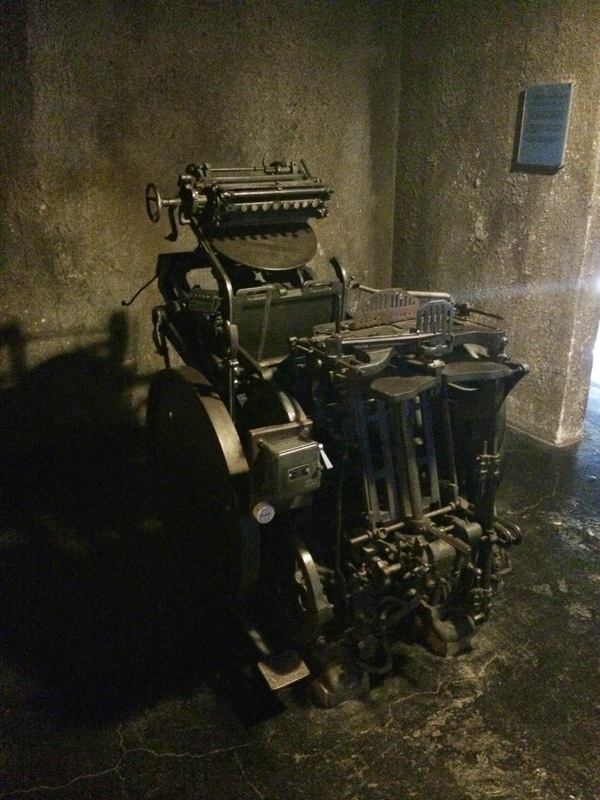 The above shows a printing press that was used by the resistance.